Kumar Yadav (name changed), a 23-years old man from a small village Bahadurpur in Bihar, had a heart disease diagnosed when he was four years old. He used to get tired very easily and had his lips and fingers appeared blue. The doctors told the family that the situation demanded surgery. However, due to financial constraints, the surgery could not be done at that point of time. 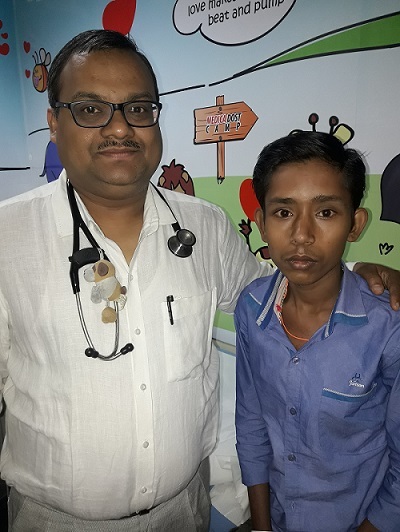 Seeing Kumar’s condition slowly deteriorating over 17 years as he got breathless even on walking for a short distance or climbing a few stairs, the family took him to a local government hospital in Bihar for treatment. On consultation, he was referred to a cardiologist in Medica Hospital in Kolkata. Now, after getting treated for a rare birth related blue heart disease without surgery at Medica, Kumar can walk comfortably and enjoy life as much as he can, which he could not do it in the past 22 years of his life. Once, a person, who could not even walk 100 meters but only panted, has got a new lease of life. Cut to the past. Dr. Rana Rathor Roy, Senior Consultant Interventional Cardiologist at Medica Superspecialty Hospital diagnosed that the young person was significantly blue. For diagnosis and necessary treatment, Dr. Rana further referred the case to Dr. Anil Kumar Singhi, Senior Consultant Interventional Paediatric Cardiologist, Medica Superspecialty Hospital. “Kumar weighed less than 35 kgs. The oxygen saturation was only 58 percent in the patient, whereas it is around 98 percent to 100 percent among normal people. His height was 4.9 feet, which is less than a normal 23-year-old person, due to his long-standing heart disease,” said by Dr. Anil Kumar Singhi. The Chest X-Ray of Kumar revealed that his heart was positioned on the right side of the chest. The Echocardiogram revealed large left-sided heart chambers but without any hole between two big chambers or ventricles, as diagnosed outside. A bubble contrast test highlighted an abnormal connection between left-sided lung arteries, which carries impure blood, to the left-sided atrium-the chamber having pure blood. Ultimately, the computed tomographic angiogram (CT Pulmonary angiogram) was done to outline the defect and a very large and dilated abnormal birth related connection between left lung arteries to left-sided atrium was confirmed. The narrowest point of the abnormal connection was huge, around one inch in diameter, larger than the size of the main big artery of the body. The impure blood was being mixed with the pure blood causing bluish discoloration (Cyanosis) of fingers, nails, and lips. The non-surgical trans-catheter procedure was done in one hour and fifteen minutes under local anaesthesia. Through leg veins, the defect was crossed with wire and small catheter. A specialized sheath was introduced in the defect area in cardiac catheterization laboratory. A large 24 mm Lifetech muscular VSD device was placed across the defect under monitoring and angiogram. Immediately, the oxygen saturation increased to 99 percent in Kumar, which is normal. “I can breathe easy. I go to the park. I was confined to home only and now after the treatment, I just simply roam around. In all the 7-weddings which took places in my village, I danced as a Barati (bridegroom’s relative who accompanies him and dances throughout the marriage procession). I hope to get married in the next five years after building my body and wish to dance a lot on my wedding day, too,” said Kumar, who works with a local contractor to put pipes on road. "At present, I can play cricket too but I prefer to play with kids and not young adults as they play at a very fast pace,” said Kumar. “Medica gives due importance to effective healthcare irrespective of the affordability of the patients. We are indeed very pleased to say that this important breakthrough in congenital heart disease treatment itself is a significant benchmark. We hope that in near future, Medica will be coming up with new milestones. Congratulations to the whole team and our colleagues for their exemplary dedication and commitment,” said Dr. Alok Roy, Chairman, Medica Superspecialty Hospital.